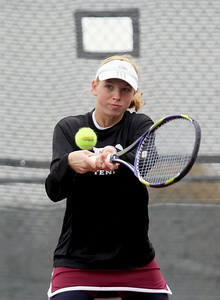 Girls state tennis day one was held on October 18, 2012. 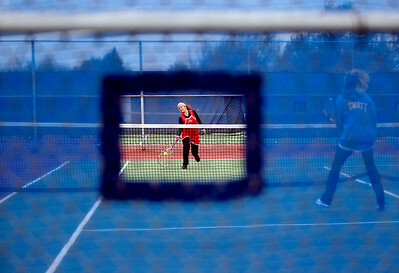 Sarah Nader - snader@shawmedia.com McHenry's Brittany Goebel (right) competes in a singles game against Whitney Young during Thursday's state tennis tournament in Hoffman Estates on October 18, 2012. 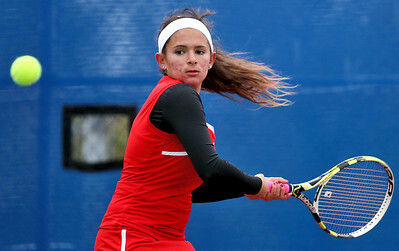 Sarah Nader - snader@shawmedia.com Huntley's Kayla Garcia returns the ball while competing in a singles game against Marion during Thursday's state tennis tournament in Hoffman Estates on October 18, 2012. 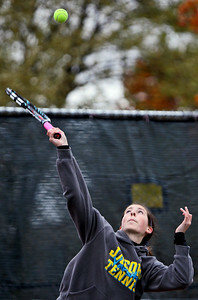 Sarah Nader - snader@shawmedia.com Jacobs' Jen Regard returns the ball while competing in a doubles game during Thursday's state tennis tournament in Rolling Meadows on October 18, 2012. 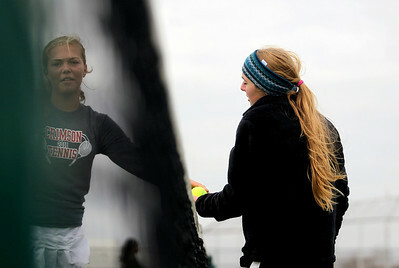 Sarah Nader - snader@shawmedia.com Jacobs' Miranda Curtis returns the ball while competing in a doubles game during Thursday's state tennis tournament in Rolling Meadows on October 18, 2012. 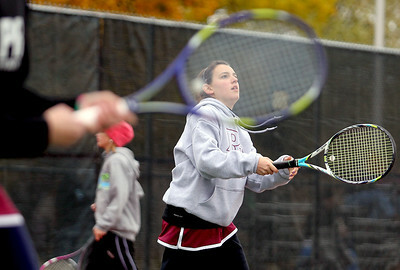 Sarah Nader - snader@shawmedia.com Prairie Ridge's Natalie Favia competes in a doubles game during Thursday's state tennis tournament in Rolling Meadows on October 18, 2012. 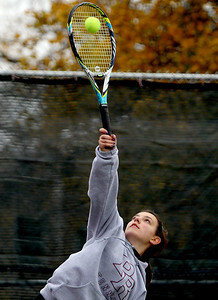 Sarah Nader - snader@shawmedia.com Prairie Ridge's Natalie Favia serves the ball while competing in a doubles game during Thursday's state tennis tournament in Rolling Meadows on October 18, 2012. 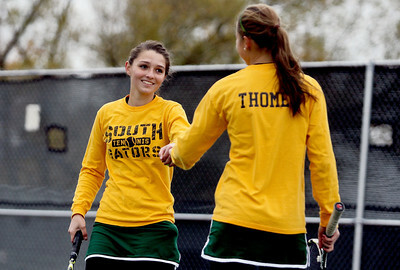 Sarah Nader - snader@shawmedia.com Crystal Lake South's Julia Thome (left) and Marisa Thome celebrate a point while competing in a doubles game during Thursday's state tennis tournament in Rolling Meadows on October 18, 2012. 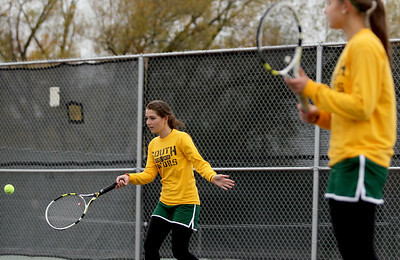 Sarah Nader - snader@shawmedia.com Crystal Lake South's Julia Thome (left) and Marisa Thome return the ball while competing in a doubles game during Thursday's state tennis tournament in Rolling Meadows on October 18, 2012. Sarah Nader - snader@shawmedia.com Crystal Lake South's Marisa Thome returns the ball while competing in a doubles game during Thursday's state tennis tournament in Rolling Meadows on October 18, 2012. 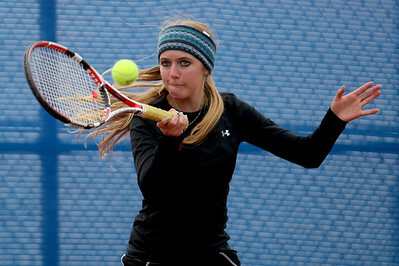 Sarah Nader - snader@shawmedia.com McHenry's Brittany Goebel returns the ball while competing in a singles game against Whitney Young during Thursday's state tennis tournament in Hoffman Estates on October 18, 2012. 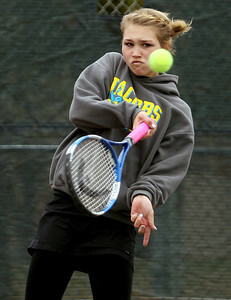 Sarah Nader - snader@shawmedia.com Prairie Ridge's Anna Kuechenberg returns the ball while competing in a doubles game during Thursday's state tennis tournament in Rolling Meadows on October 18, 2012. 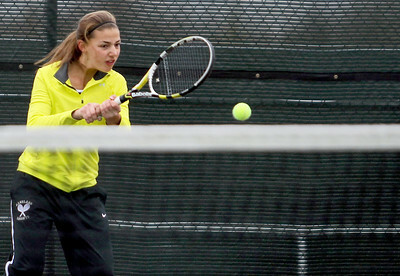 Sarah Nader - snader@shawmedia.com Kaneland's Angelica Emmanouil returns the ball while competing in a doubles game during Thursday's state tennis tournament in Rolling Meadows on October 18, 2012. 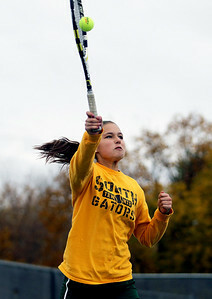 Crystal Lake South's Marisa Thome returns the ball while competing in a doubles game during Thursday's state tennis tournament in Rolling Meadows on October 18, 2012.